The preferences of younger professionals will likely have a significant impact on how real estate companies approach everything, reports Commercial Property Executive. A recent Harvard study revealed that open plan offices stifle rather than encourage face-to-face collaboration. But, asks Inc., where do you go from here, office design-wise? Whether you’re a telecommuter seeking a change of scene, a solo entrepreneur or a startup, the benefits of operating within a supportive environment like a co-working facility are key, reports the New York Post. 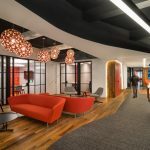 Seat sensors, infrared cameras, footfall trackers, surveys, analyzing email traffic patterns, badge swipes and conference room reservation systems: This information is being used to develop office designs that not only optimize the space but also improve the employee experience, says the Chicago Tribune.